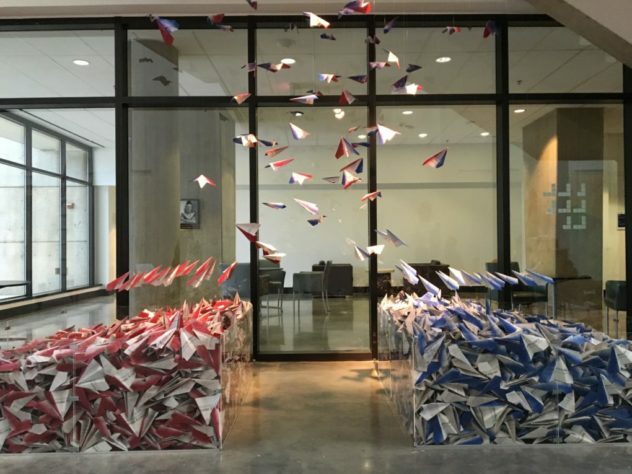 Through October 23rd, you can experience for yourself a year’s efforts of the United States Congress, folded into 10,718 paper airplanes. The American University Museum at the Katzen Center is open every day except Mondays, from 11AM-4PM. Last summer, I began to fold these airplanes all by myself. Thirty airplanes a day was what I would have to fold to keep up with the incoming issues of the Congressional Record. I folded in doctor’s waiting rooms, on airplanes, at every opportunity I had. Interestingly, people began offering, indeed asking, to help fold. And I let them. Folders spanned age groups and ethnicities, income brackets and ideologies. They folded to have a voice. Because of the significant interest in this project, I gathered a terrific group of pro bono professionals who created an opportunity for many more people to fold: through the creation of UpdraftAmerica.org. There you will find downloadable letters you can address to candidates telling them you will only vote for those willing–and brave enough–to bridge the political divide. You will also find links where you can learn more about individual candidates. 10,718 Paper Airplanes folded from a year’s subscription to the Congressional Record. When words and reason no longer seemed to make a difference, I began to create this art installation. Do your part to create change.